FACTS OF INTEREST: Burrowing owls are found in open grassland or desert habitat, from the Canadian prairies down through much of South America. Burrowing owls hunt during the day when they can be seen running around on their long legs like roadrunners. 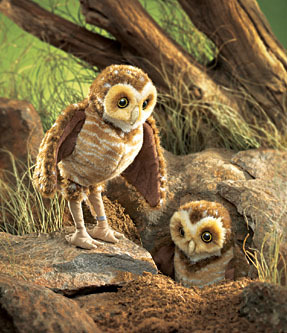 Even though they are called burrowing owls, they usually move into a burrow that has been abandoned by a rodent. Burrowing owls are endangered in Canada and of special concern in the western U.S. and Florida. They are threatened by poisons used for crops and by habitat destruction.